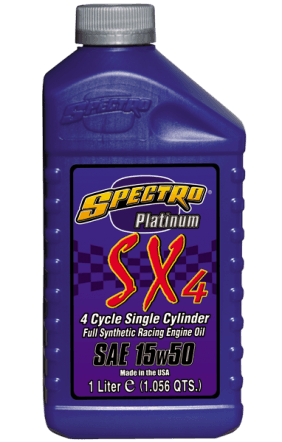 Platinum SX4 is the ultimate full synthetic motor lubricant for all four-stroke motocross and off road machines. SX4 is extremely shear-stable and designed specifically for use in high RPM racing conditions. Cams, rods, cylinders and pistons benefit tremendously from our increased ZDDP anti-wear additive treatments. Meets all known motorcycle manufacturers’ warranty requirements and recommendations. A.P.I. SH/SG, JASO MA. For use in KTM, Yamaha YZ-F, Honda CR-F, Suzuki RM-Z and Kawasaki KX-F four stroke racing engines.